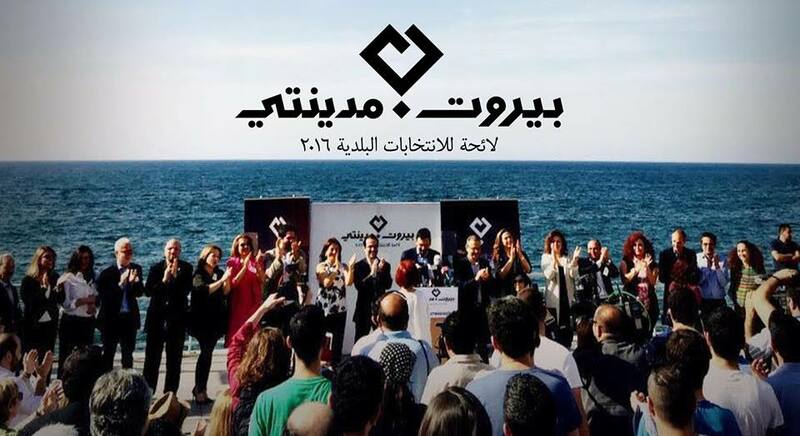 Lebanon's municipal elections are in TWO DAYS! Unlike past terms, there's a new crew in town this year. If you haven't heard, they're called Beirut Madinati, and my, my, my, have they been popular. On social media, their content has gone viral; in fact, so viral that it's impossible to go a day without coming across that young but oh-so-familiar logo at least three times on social feeds. More so, tributes to Beirut Madinati from artists and designers are flowing in and Lebanese youth are showing their support in extravagant ways, doodling the BM logo across their bodies and baking desserts in its shape. Behind Beirut Madinati is an incredibly energetic team of designers who seem to understand the relevant ways in communicating a campaign, employing fun media like witty videos and flashing GIFs. Their campaign is possibly the first municipal effort to garner that much social reach in a single shot. They're also the first political campaign in Lebanon to take on crowdfunding for their core activities, almost hitting the 200k mark in dollar donations from individuals. I got the chance to chat with the team, and of course, snuck in a question about their favorite color. Make sure to play the videos to get an idea of what Beirut Madinati have in mind for the city. What's the story behind the Beirut Madinati logo? The logo icon is quite a simple shape, it is based on the letter ‘ba’, it is an open heart, it has the geometry of a plan and other urban representations. Who's behind the designs of the campaign? Is an agency involved? We are a group of professional creative and art directors, designers, animators, illustrators, photographers, etc. But also, people from many professional sectors and from all over the world have been sending us many visuals as contributions. We are all behind the visuals of the campaign. In a country that associates colors with political parties, where on the rainbow do you fall? We are none of the colors and we are all of the colors: we are black and white, yet our background color scheme is infinite, based on the diversified color palette of the urban fabric. You've published engaging videos and GIFs on your social pages and you've also launched an app. Have they helped you communicate with Lebanon’s younger generations? Yes, they have. We got a lot of interactions from different age groups. Videos, Animations and GIFs do not only communicate to the younger generations but they allow to illustrate a body of content and convey information in a simple and clear way. We all used to wonder what is the role of the municipality, why is the process of decision making so complex, how can we promote change, etc. By verbally and visually communicating these ideas through short stories the process was clarified and made accessible to a wide audience. To what extent is design important in communicating your campaign? The design of our campaign is essential because it participates to defining a language that will reflect the new political, social and civic phase we are entering. At the same time, it has also been revealed that design can be irrelevant in front of more important issues our society is facing today. Because of the nature of our collaboration, our communication has been quite eclectic and we have received a huge amount of creative initiatives from designers and non-designers alike. These prolific collaborations do not follow any design norm but they are spontaneous, expressive, bold, supportive, varied. They reveal the incredible thirst for new forms of politics and representation. In terms of your mission, is the promotion of arts and culture part of your plans? Of course, cultural and artistic expressions are at the heart of every city, and the municipality can play an important role in their promotion. We believe in a city equipped with spaces and animated by events of communal social interaction. In fact, many of our volunteers and candidates are recognized cultural agents in varied fields. We will stay committed to the promotion of all forms of creative expression during our campaign and through all our next steps. How can artists and designers join Beirut Madinati? They can send their contributions or ideas for initiatives to social@beirutmadinati.com and we will follow up with them from there. They can also join our team as volunteers. Learn more about Beirut Madinati's plans on their website.